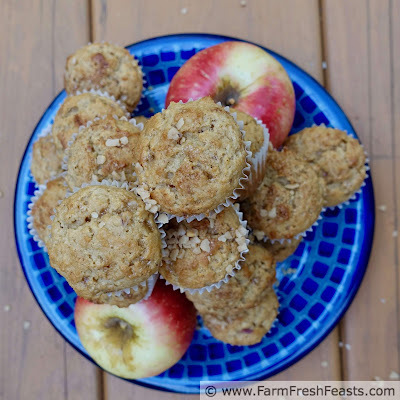 An easy blender muffin recipe combining apple chunks and toffee chips in a cinnamon-laced batter. I'm still exploring my new stomping grounds. Over the weekend we hiked around the Minnesota Landscape Arboretum, part of the University of Minnesota--those geniuses behind the Honeycrisp apple and the apple I used in today's muffin recipe--the SweeTango. My first bite of this apple I thought 'hmm, nope, it's a bit too tart for my tastes' but it's grown on me as I work my way down to the bottom of the bag. I have a couple left and will make apple crisp out of them, but I can already tell that they're good for baking since they make a tasty muffin! Eating with the seasons means that the changing seasons equals new produce to play with! I'm pretty excited that the cooling temperatures arrived in conjunction with new flavors of apples for me to try so that I could join in with the Muffin Monday crew. Summertime baking in a house without central air conditioning was a non-starter for me. Glad to be back. 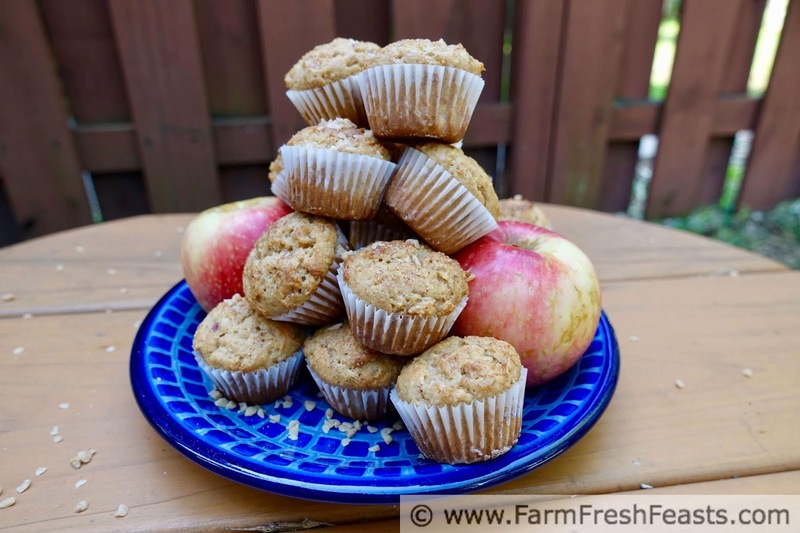 Although I've made a variety of apple muffins over the years (Apple Cinnamon Muffins, Apple Oatmeal Muffins, Cheddar Apple Muffins to name a few) I'm still game to try new things. 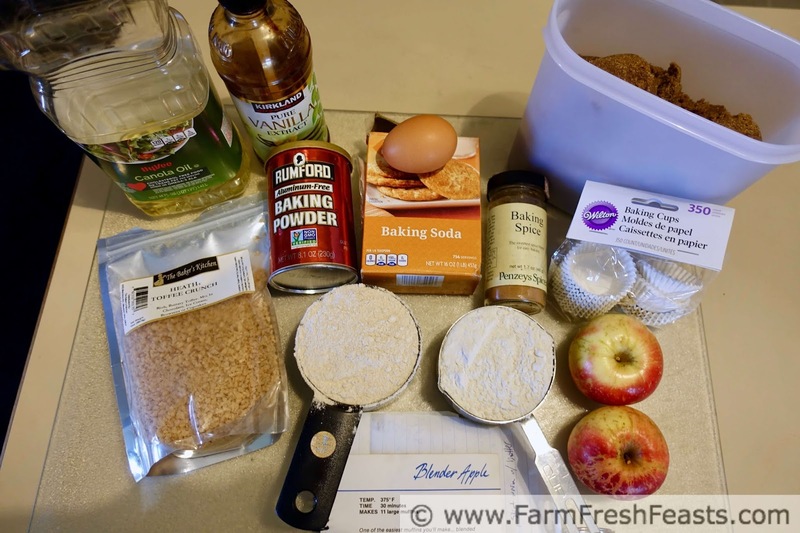 I've been playing around with some toffee bits and decided Toffee Apple Muffins would be a great idea, so I consulted my muffin bible and found a recipe I'd never tried--Easy Blender Apple. I modified it a bit--reducing the sugar and upping the percentage of whole wheat flour, as well as swapping yogurt in for milk, and adding toffee chips--and the result was easy to make as well as pretty darn yummy. This month has been about figuring out our New Normal. What do you do when your most important role has been Mom for 20+ years, and all of a sudden there are no kids at home? Well, for starters you only need to buy 2 tickets to Hamilton, so that's a savings. Of course the whole college tuition thing kinda negates that savings, but we're keeping positive here. Yes, my spouse and I went out to see Hamilton over the weekend and it was as wonderful as I expected it to be. My tip--if you're planning to go--is to listen to the soundtrack obsessively. I had to hold myself back from singing along (I know I was bobbing my head) but my spouse had trouble making out the lyrics at times. He missed out--such clever writing and such a tight production. But I digress. You're here for the recipe. This muffin recipe starts with apple chunks whirling around in a blender and ends with cinnamon sugar sprinkled atop the ready to bake batter. Want to see step by step video of how to make it? Watch the video below! Note: Since we are just two at home, I've been making batches of mini muffins and sending them off with my spouse. He comes home empty handed and the cadets and cadre get a snack, so it's a win-win for me. If you're making regular size muffins, please bake them 15 to 18 minutes. Make it easy on yourself and save a dish--first measure the oil into a 1 cup measuring cup, then fill up with yogurt. Don't peel the apples, just core and chuck the chunks into the blender. If you want to boost the nutrition, use all whole wheat flour instead of half whole wheat half all purpose. Preheat the oven to 400 degrees Fahrenheit. Line a 24 well mini muffin pan with papers, or spray well with oil spray. Blend together egg, oil, yogurt, brown sugar and apples. Pour into dry mixture, then stir briefly. Stir in toffee chips and mix until just combined. Scoop into prepared pan, filling muffin cups nearly full. Sprinkle cinnamon sugar atop muffin cups. Let cool in pan 5 minutes, then transfer to a cooling rack. Repeat with remaining batter. Serve warm or at room temperature. For more recipes using apples, please see my Apples & Apple Cider Recipes page. It's part of the Visual Recipe Index by Ingredient, a resource for folks like me eating from the farm share, the farmer's market, the garden, the neighbor's garden, and great deals on ugly produce at the grocery store. #MuffinMonday is a group of muffin loving bakers who get together once a month to bake muffins. You can see all our of lovely muffins by following our Pinterest board. 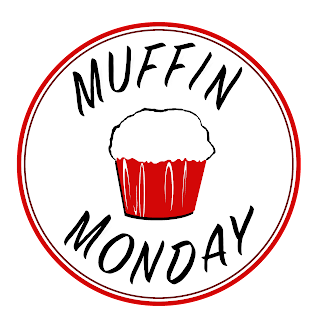 Updated links for all of our past events and more information about Muffin Monday can be found on our home page. Here's what we're baking this month! 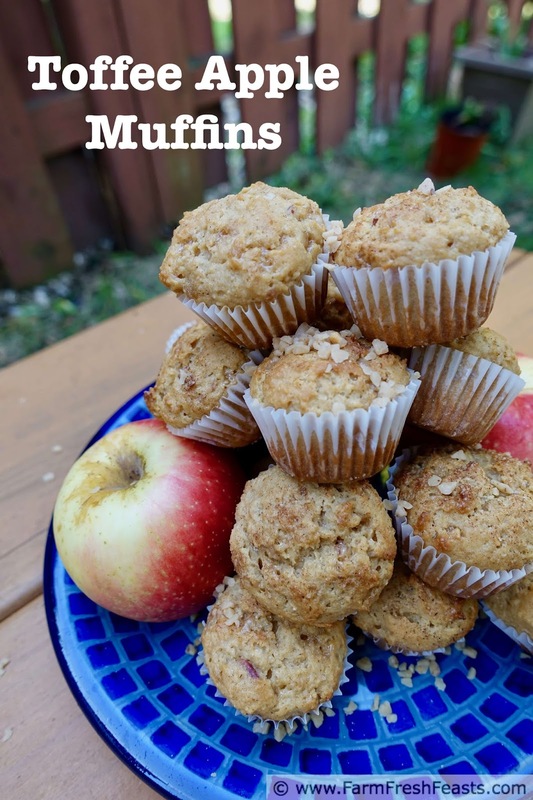 Blender muffins is a new one for me, Kirsten but it's an idea I can totally get behind. Whatever makes muffin making easier is a good thing! I completely agree about Hamilton. My daughters listened to it obsessively so I absorbed the lyrics by osmosis but it took me a few times to get them all. I can't imagine hearing it the first time at a live performance. I'm at the point that the Hamilton Mixtape is piped directly into my ears on dog walks. Such great songs! My current favorite is the twist on 'Say No To This' sung by Jill Scott. Just terrific. Thanks for hosting Muffin Monday, I'm glad to join in! I'm not familiar with Sweet Tango but I love Honey Crisps. The toffee chips sound delish. I've never tried a blender muffin before either! I love the addition of toffee bits into an apple recipe! Welcome back. I'm ready for your muffin madness especially since we live in a house with AC, which is still running even in October because it's still really warm here and on cooler days, the humidity has been high. 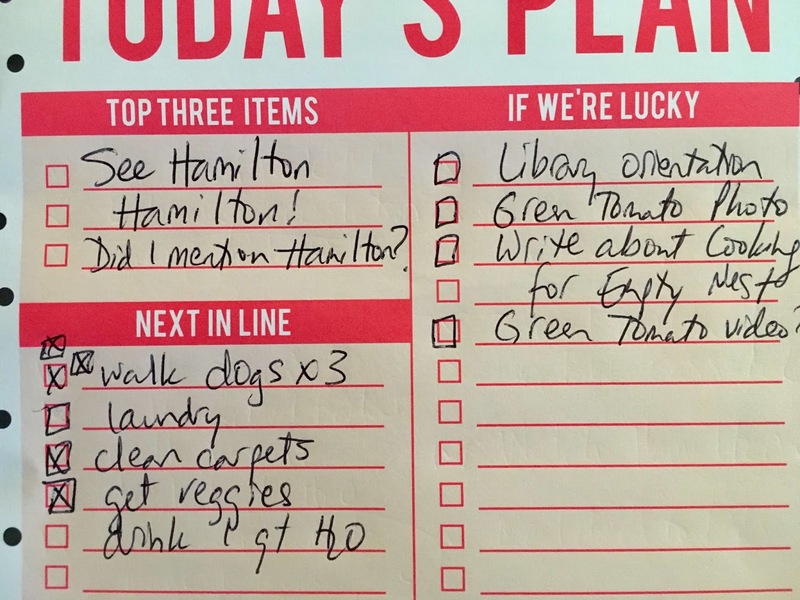 I love the toffee bits and the to do list. Both give me all the warm and fuzzies.